"Only the legend will survive." The year is 1888. 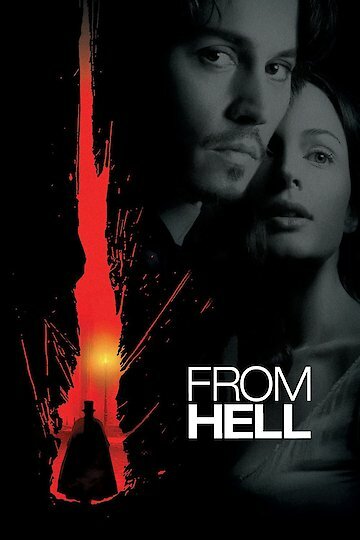 In London, England the notorious serial killer Jack the Ripper is on the loose and killing prostitutes. This is the profession of Mary Kelley and her friends, some of whom are murdered. Working with the Whitechapel police force, Inspector Frederick Abberline, who also has drug induced clairvoyant visions, goes on the chase for Jack the Ripper. Faced with the brutal and relentless murders of women of the night, the police force must do what they can to stifle the panic and paranoia that comes from such happenings. Inspector Abberline is the best Inspector because his visions and keen observation skills allow his to see what happened at the scene of the crime and find clues that determine the way each victim was slaughtered. The woman Mary Kelley faces the dangers of having a pimp, the serial killer on the loose and overall hazards of her job. She is hesitant to assist Inspector Abberline because of this, but after the loss of friends she gives in. Abberline and Mary eventually develop a serious affection for one another. One of the women that goes missing is Ann Crook. She is later found in an asylum after having a lobotomy. Ann had recently married young Prince Edward and gave birth to their daughter Alice, heir to the British throne and a perceived threat to the Royal Family. Abberline soon uncovers the gruesome actions of the high ranking Freemason and Royal Physician Sir William Cull and his medical like precision in slaughtering the prostitutes. It is believed that he is also responsible for covering up the marriage by silencing Ann with a lobotomy. Mary Kelley escapes the grasp of Cull and moves with baby Alice to a cottage by the sea. Abberline is heartbroken because he will never be able to see her without giving away the sanctuary she has gained. He is found dead of an opium overdose. From Hell is currently available to watch and stream, buy on demand at Amazon, Vudu, Google Play, iTunes, YouTube VOD online.